New report says more can be done to prepare young people for university. 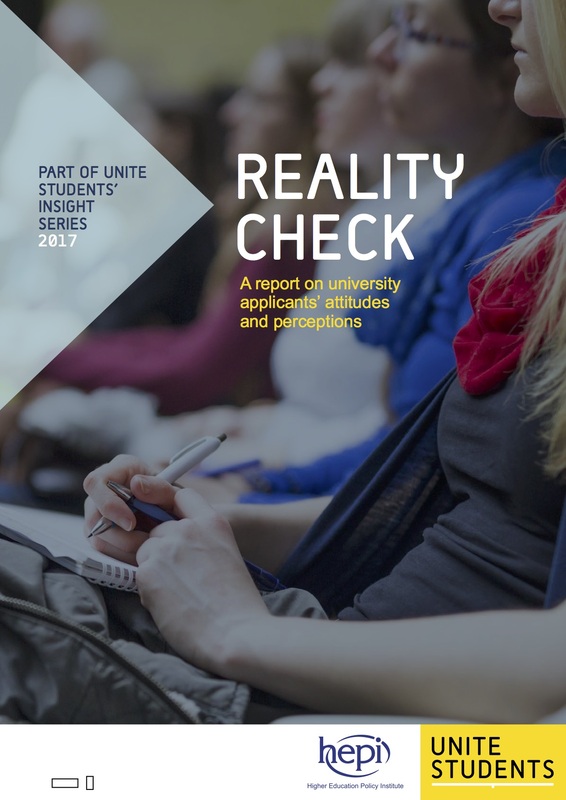 The first major survey of its kind, Reality Check: A report on university applicants’ attitudes and perceptions, produced by the Higher Education Policy Institute (HEPI) and Unite Students, shows a significant gap between what university applicants think higher education is like and the realities of student life. The research shows that applicants prepare for university in a state of mixed emotions. While 81% are excited about the prospect, 61% are anxious, with 58% having had trouble sleeping and 27% reporting panic attacks in the past year. The report highlights a number of specific areas where applicants’ expectations are out of step with the reality. 60% of university applicants expect to spend more time in lectures than they do in school lessons, yet only 19% of students find this happens. Only 37% of applicants with a mental health condition have declared, or intend to declare it, with their prospective university. While most applicants (62%) believe they have a good grip on money matters, only 43% are confident about paying a bill and only 41% feel they understand student finances, with many under-estimating essential expenses. Almost half (47%) of all applicants feel unprepared for living with people they have never met before, with gay, lesbian, bisexual and other sexuality applicants less confident about making friends (58%) than heterosexual applicants (74%). While most applicants (67%) are confident they will find the right support for any mental health issues, friends emerged as the first line of support for most applicants (85%). Half (50%) anticipate turning to academic staff, ahead of university counselling services (47%) or their GP (43%). The research, which surveyed over 2,000 applicants, also provides early insight into applicants’ perceptions of the new Teaching Excellence Framework, with 72% of applicants saying a Gold rating is important to them. The report’s authors believe that there are a number of ways in which universities, policymakers, schools and accommodation providers could work together to provide a smoother transition to university life. These include: better pre-arrival communications; the teaching of important new skills for applicants that will stand them in good stead; and improvements to the pre- and post- arrival experience for students. We know lots about what students think but very little about what those applying to higher education expect to happen when they get there. We set out to fix this because people who expect a different student experience to the one they get are less satisfied, learn less and say they are getting less good value for money. Most applicants expect to spend more time in lectures than they do in school lessons, but few university students actually do this. Applicants have also thought little about how they will budget, with a majority unaware that rent is likely to be their biggest cost apart from tuition fees. Almost three-quarters of them expect their future university to contact their families if they face mental health issues, but this is a legal minefield so typically does not happen. Schools, parents and universities – not to mention policymakers – all need to help school leavers get real about their expectations. But, where applicants’ expectations are reasonable, the whole higher education sector needs to consider what more should be done to meet them. The findings of this report show a number of areas in which applicants’ expectations do not match up to reality. Coming at a time when applicants are simultaneously stressed from exams, worried, nervous and excited about moving away from home for the first time – this may have a tangible effect on the start that students make in those crucial first few weeks or months of university. For this reason, we hope that these findings prompt a thoughtful and considered response from a wide range of parties – universities, schools, policy-makers and accommodation providers alike – to consider the ways in which, working together, we can help young people to get the most out of their time at university. 66% of applicants expect more group work at university than school but only half of students (52%) say this occurs. Almost half (46%) of applicants anticipate more one-to-one support than at school, but only 36% of students find this to be the case. A large majority (78%) of applicants expect more career-planning support at university than at school but only 61% of students report this to be the case. 49% of applicants would be content for their university to contact a parent about their mental health in extreme circumstances and a further 23% in any circumstances. 13% of applicants surveyed declared a mental health condition. 16% of respondents identify themselves as lesbian, gay, bisexual or other non-heterosexual sexuality and these applicants are less confident about making friends (58%) than heterosexual applicants (74%). 75% of applicants from socioeconomic groups A/B (professional and managerial households) say they felt prepared to make friends at university, as opposed to 63% of applicants from groups D/E (unskilled and workless households). The overwhelming majority of applicants expecting to live away from home say living with people they like is more important than the specification of accommodation (88%). 78% of applicants expect to get more financial advice from their university than at school, but only 60% of students say this happens. Only 49% of applicants recognise rent is likely to be their largest cost apart from tuition fees. 39% of applicants have received advice about how to manage money at university from a university and 38% have received advice from school. James Seymour, Director of Admissions, University of Buckingham. There are a limited number of press places available at the launch. To see the full programme, see www.bookwhen.com/hepi. HEPI’s mission is to ensure policy-making is informed by evidence and research. We are UK-wide, independent and non-partisan. I really interested in your findings on students mental health issues…and how Hepi’s findings show 49% students would agree to family members being contacted when mental health issues arise. I would love to see university policy change and allow a question at student application stage, to allow family to be contacted if the student agrees. I have a personal reason for my interest and have drawn a blank so far with Birmingham University around this matter. Thank you for your findings.